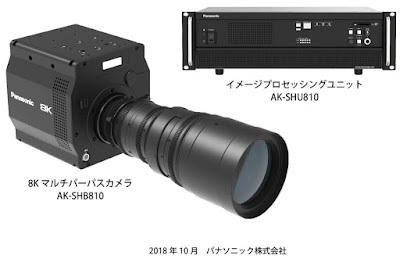 Panasonic announces a 8K Multipurpose Camera AK-SHB 810 based on the world's first organic film image sensor presented at the number of conferences and in papers. The mass production of the new camera is expected to start at the Fall of 2019. "8K / 4K / HD video output is possible from the camera unit and the image processing unit AK-SHU 810 connected with optical fiber cable." One has to wonder if this is beginning of the end for silicon detection? I don't think so but would we realize it when it happens? What do others think? I'm a little bit suspicious to see a separate image processing unit here. Other cameras do not seem to need it. Calibration per pixel may be required to remove thermal noise, color shift vs. temperature, and color shading thus heavy image processing? I did not expect a separate image processing unit. The main camera is almost twice as large as it should have been, plus an external ISP. Makes me think they gave up on fixing their organic film, at least because they had to release by a certain deadline and decided to calibrate the crap out of it. Organic film last I checked had a fairly large image lag, especially for bright objects, I wonder if they were able to fix this in their organic film processing/deposition. Makes me sad that they have to use 10V bias, makes it out of reach for mobile. But hey, at least they're promising to mass produce within a year, after publishing on the technology development for what, 12 years? Silicon is VHS/cassette technology, Organic Film is CD and "***********" is BluRay. It is nice to see that somebody keeps investing heavily over years to bring a technology closer to maturity. If it is yet the end of CIS, I am not sure. For RGB imaging i do not yet see the fundamental benefit. Should it be cost? CMOS-IS has become pretty incredible by now. We have pixels at the diffraction limit size, close to single ph detection and virtually no dark current. If with organic we could get stacked RGB in one pixel I could see a key selling point. It may though be a great technology for the NIR SWIR imaging. Maybe faceID and alike could make those large enough markets to produce returns on the organic investments.